It’s no surprise I’m a lover of food and colors 🙂 So for this week’s art tutorial, I wanted to share one of the videos that is part of my new Skillshare Class: How to Sketch a Watercolor Rainbow Pattern (Snacks Edition). I had a lot of fun creating this class and one of my favorite sketches was doing this lollipop. I can’t believe how easy it was to paint, too! I think you’ll have lots of fun with this one! Step 1. Sketch the semi-oval shape. 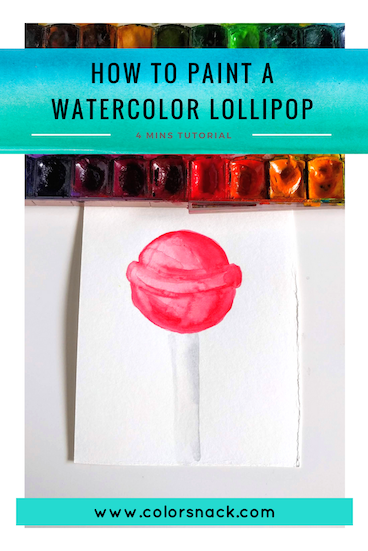 Load up your brush with watercolor paint and start your lollipop sketch by drawing a semi oval. Step 2. Next, sketch the ridge part of the lollipop. It will resemble 2 slightly curved lines, with a little protrusion at both ends. Step 4. Since we used lots of pigment with your brush, you can now wipe it on a towel and squeeze a drop of water onto your sketch. Start pulling in the color from the lines into the middle of the shape. Be mindful to leave the left hand side of the lollipop fairly light, so as to indicate the light source and give your sketch more dimension. You can always wipe off the excess color from the brush and blend in with a wet brush. Step 5.The right hand side will be darker, so keep adding a few more watercolor layers to it. The ridge part of the lollipop will also have pretty dark lines , to indicate shadows. Step 6. 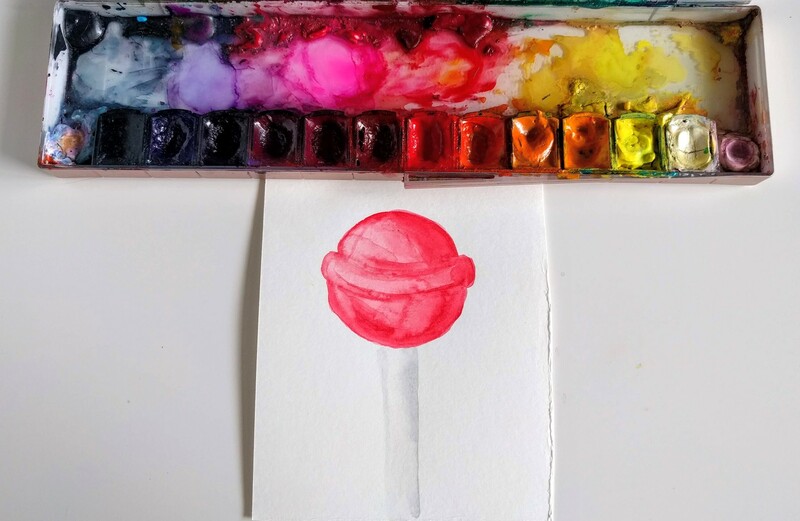 Use payne’s gray or a black color diluted with water to sketch the lollipop stick. Similarly to our lollipop, the left hand side will have a highlight and the right hand side will be a bit darker.